Laine Brown, a spirited and passionate male impersonator born on North Carolina's rural coast, transforms by taping down her breasts, shaving her head, and studying the masculine performances of today's most famous male entertainers- to become the incomparable NATION TYRE, show-stopper and ground-breaker for women in drag. Challenged by a desire to please all of those that love her, Nation is on a mission to generate acceptance for women like her. As she pushes the bounds of female gender identity, is there room for a lone performer, to challenge the constraints at work in the African-American and LGBT community in pursuit of fame and visibility on the world stage? In the new feature documentary ﬁlm M.I., A Different Kind of Girl, ﬁlmmakers, Leslie Cunningham and Alana Jones enter the world of new millennium drag and pick up the torch ignited by documentary ﬁlms like Paris is Burning to investigate attitudes in their own LGBT and African- American communities about women in drag. In the process, they uncover powerful ideas about female gender identity and sexuality in not only the mainstream popular culture but also within the marginalized LGBT and African American communities where Nation has made a name for herself. In her fledgling years on stage, Nation's drag ‘family’, the House of Tyre of Atlanta, GA, helped mold into a ‘super studd’, embodying a 24-hours-a-day, seven-days-a-week gender performance that rejected the “trans-” label but required a commitment to masculinity that left Nation feeling pressured to abandon the reality of her femaleness. The family, headed by Sincere Tyre, an established M.I. in his own right, wants Nation to be “harder,” and ultimately return to Atlanta where this strict and complete dedication to masculinity dominates the female drag scene and Male Illusion is more accepted in the LGBTQ community. Nation’s fiancée and biological family, while increasingly accepting of her sexuality and career as a Male Illusionist, want her to be more feminine in life. Ultimately, she is challenged by a desire to please all of those that love her. Yet ultimately, Nation is on a mission to generate acceptance for women like her, a rainbow of more and less masculine women and Male Illusionists and crack the nut of pop culture as a proud ‘natural’ woman reaching for stardom from the drag stage. 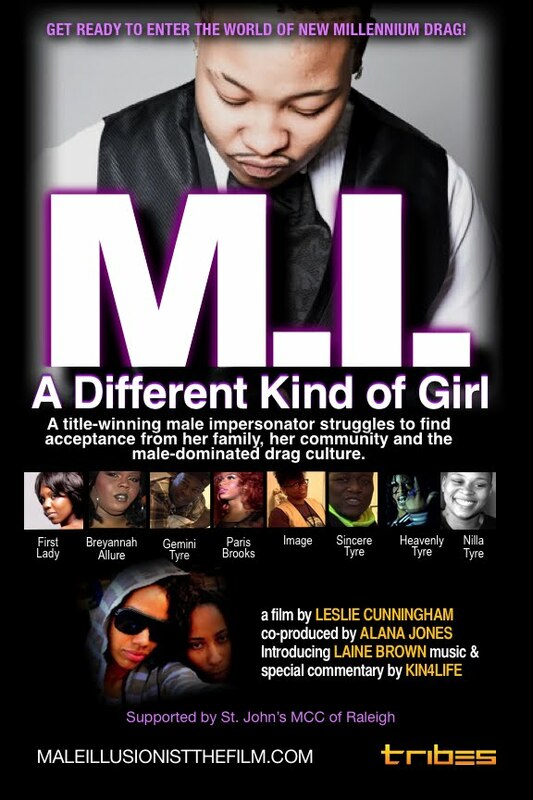 Set in the American South, this thought-provoking film from TRIBES Entertainment Films, uses candid interviews, performance footage, artful b-roll, images of striking green in the Carolina Piedmont and more to bring viewers through the flashing lights into the heart of Nation Tyre (M.I.). Introducing Laine Brown as Nation Tyre, The House of Tyre, Breyannah Allure, Paris Brooks, Image, First Lady, Hollywood and many more. Featuring music and special commentary by Hip Hop’s hottest female duo, KIN4LIFE.